Featuring special guest…flying in just for this party, GT Lab’s JIM OTTAVIANI!!! 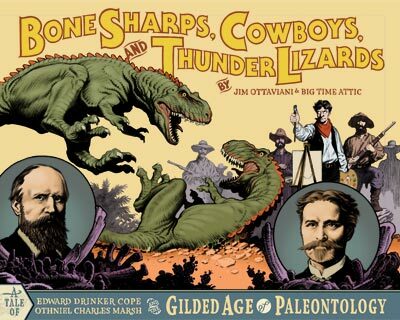 The 168-page true science epic about two ruthless wild west paleontologists will be available for the first time anywhere, and Jim Ottaviani and Big Time Attic will be on hand to sign copies, tell tales, and show off the original art. Bring in your dog-eared copies of “Two-Fisted Science” and “Suspended in Language” to get signed, or any of BTA’s individual books…or, hey, just come for the free beer and stand in the corner quietly until the beer runs out. The Wild West provided the setting for some famous battles, but the gunfight at O.K. Corral doesn’t hold a candle to the Bone Wars. Following the Civil War, the (Re-)United States turned its attention to the unexplored territories between the Mississippi and the Pacific. The railroads led the way, and to build them we blasted through mountains and leveled valleys and exposed rock that hadn’t seen the light of day for millions of years. This is the story of Edwin Drinker Cope and Othniel Charles Marsh, two scientists who found and fought for those bones, and the artist Charles R. Knight who almost single-handedly brought dinosaurs back to life for an awestruck public. Guest starring Chief Red Cloud and hundreds of his Indian Braves, the gun-totin’ and gamblin’ Professor John Bell Hatcher, colossal and stupefying Dinosauria of the New World, and featuring special appearances by The Cardiff Giant, P.T. Barnum, Buffalo Bill Cody, Ulysses S. Grant, Alexander Graham Bell, and a plentiful supporting cast of Rogues and Gallants from the Eastern Scientific Establishment and The Old West, the colorful supporting cast makes for a rich blend of history, adventure, science, and art.